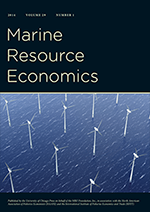 Abstract: We conduct a choice experiment to investigate whether U.S. gasoline consumers exhibit limited attention to the costs of searching for lower prices. When consumers search for prices as they drive, the search cost is a function of the amount of gasoline consumed while driving and the time spent searching for prices. We randomize the amount of information we provide the respondents to a survey about search costs in one of 3 ways: time, gasoline, or both. Results indicate that cognitive costs cause inattention to time costs. We also find that respondents overestimate the cost of the gasoline used while driving, thus forgoing consumer surplus.